A list of books with the focus on ‘p’ (and some ‘b’) sounds. Pigs, pants, penguins and lots of pink! Pip & Posy : the Little Puddle The Pip and Posy series are beautifully and clearly illustrated. Very suitable for toddlers and preschoolers. In this book you can get practice at ‘Pip’ and ‘Posy’ on every page. When Pip wets his pants, there is a puddle on the floor. Words to Try – Pip, Posy, pig, pants, puddle, painting, bath. Peppa Pig and the Muddy Puddles. Peppa Pig is a popular character amongst toddlers. Any of the books will give many opportunities to practice the targets. Words to Try – Peppa Pig, Mummy Pig, Daddy Pig, puddle, boat, polly parrot, shop. Pants. A funny book about underwear! Lots of different sizes and shapes of ‘pants’ are on each page. Babies, elephants, monkeys – everyone is wearing frilly / spotty / or pink pants. Many, many opportunities to practice the target ‘pants’! Words to Try – pants, green pants, spotty pants. More Pants. Another book about pants! Peepo . An old classic with a rhyming lilt to help with memory. This book has a cut out in the middle of the page for babies to turn over. Younger toddlers can just say ‘peepo’ or ‘peekaboo’ on every page. Older toddlers can also try some other targets. Words to Try – Peepo, baby, bed, ball, park, boat, bath. That’s not my puppy. From the ‘That’s not my..’ series. A very simple touch & feely book for toddlers. You can use sentence completion of – that’s not my …….. for the child to reply ‘puppy’ on every page. Also, great for phrase level – ‘not my puppy’. Words to Try – puppy, not my puppy. Thats not my penguin . Another ‘That’s not my’ book. Mrs Pirate. A very simple short book, with hardly any storyline. However, clear pictures with lots of p & b words to practice! Words to Try – pirate, pie, patch, soap, telescope, parrot, buttons, big boat. Brown Bear Brown Bear what do you see? The classic book with its rhyming patterns are great for practicing ‘bear’ in a repetitive fashion. Additional targets – sheep, purple. Words to Try – bear, sheep, purple. Where is Maisy’s Panda? A delightful board book for toddlers to lift the flap on each page. On each page you can ask ‘Where is……. ?’ and child can answer ‘panda’. There are a few additional targets with ‘b’ sounds as you look for panda in the bed, bath etc. Words to Try – panda, (b) bed, bath, box, basket. Maisy’s Pool. Another Maisy favourite about a hot day and a paddling pool. Maisy and her friend get the pool out and puff into it to blow it up. They paddle around in the pool. Words to Try – pool, paddle, put, puff. Pirate Pete. This is a great book to be used in so many ways! Each page has 6 cut out pictures to choose from which can then be slotted into the page to create your own story. What a fantastic way to get loads of practice with the same book! Words to Try – Pirate Pete, pig, purse, party hat, pirate hat, parrot, patch. Pinkalicious and the Pinkatastic Zoo Day. An early reader with a simple storyline – still great for those who can’t read! ‘Pinkalicious’ might be too complex to imitate and so this can be reduced to ‘pink’ girl if needed. She goes to the zoo with her family and has a picnic. Lots of chances to say ‘pink’ when she waves her wand. Words to Try – pink, picnic, Peter, painting. 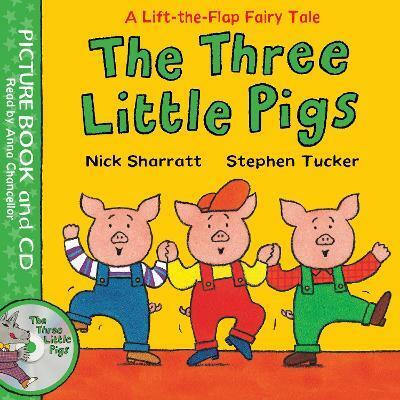 The Three Little Pigs This old fashioned story is perfect for ‘p’ practice! Many opportunities to produce ‘pig’ during the story and at phrase level – first pig, second pig, third pig. Some children will love to repeat ‘Little pig little pig’ or ‘i’ll huff and puff’. Words to Try – pig, first/second/third pig, little pig little pig!